Regional Council Hof Ashqelon (meaning: Ashqelon Sea-shore) is situated in the south shore plain between Ashdod and Gaza Stripe, around the city of Ashqelon . Est. 1950 and has 8,000 inh. The flag has been reported as a emblem on monochrome, probably blue on white but no confirmation. The municipal emblem was published in the official gazette (Rashumot), 'Publications Gazette' section (Yalkut HaPirsumim), YP 934, 31 May 1962. This Regional Council govern 19 settlements: Bet Shiqma, Bre'hiya, Bat Hadar, Gvar Am, Gi'ha, Hodaya, Zikim, Heletz, Yad Mordekhai, Kokhav Michael, Kefar Silver, Kremya, Mavqi'im, Mish'an, Nitzan, Nir Israel, Nitzanim, Netiv HaAsara and Talme Yafe). 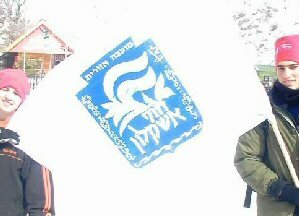 According to a photo at <www.hof-ashkelon.org.il>, the flag is white.